I would like to express my sincere appreciation for the service I experienced whilst on holiday in KZN. I purchased a helmet and some other stuff from really friendly and helpful people at your dealership, but most importantly I had a battery problem last Saturday and you guys were awesome in helping me out. Firstly, if I may absolutely reiterate the gloriousness of the counted ways that my husband has darlingly pointed out in terms of the purchase of this second Fatty. 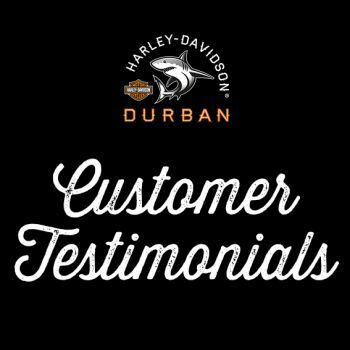 There is no vehicle I have ever purchased or witnessed being purchased that has come close to the level of service that we have encountered from Harley-Davidson Durban. AD certainly deserves a special mention - that cutie pie has always just been a Carmichael favourite and we adore him and he really treats us like royalty; the little touches he puts on making things extra special is so appreciated (I remember him making a sign saying "Brad's Bike", so awesome and personal). Thank you so much for everything that has been done for us at Harley-Davidson Durban. As for my husband, well, I'll have to thank him separately... how do you thank the man who just bought you a Harley-Davidson® for your birthday? Where do you even find the words? I'll have to really think of something stupendously out of this world to try and muster up something good enough. Wow, so the next Fatty is nearly here. She needs me. I'll hold on to the Nightrod for the littlest bit longer though. "I walked into your store on Friday just to browse. It was a dream dat i didnt have the courage to fulfill. I was welcomed by Adnaan an treated with great care an warmth. Next minute Shaun was by my side an they gave me the confidence courage an advise i needed. Thanks guys for the lovely service from the start to delivering my bike with love an care. Everyone in the store came an congratulated me. What an experience. Thanks again"
"They give the best service ever. Every customer who walks in is like family to them". A few months after purchasing his fourth Harley-Davidson® motorcycle (2016 Fat Boy®) in October 2016, Colonel F.F. Chamberlain found himself in a situation where his bike required urgent attention. During this period, Franco made a number of calls to the Harley-Davidson® Durban dealership and thought that he would comment on the service that he received. "Our home away from home. Staff is awesome! Service is great. Food is excellent!" "1st time using the dealership, great service. My Harley had a faulty fuel gauge and we ran out of fuel on the road, one call to the dealership, quick and efficient, one call back from them to say that there service tech is on the way to help, not even 20 minutes and we were on the road again, service with a smile!"